Who says Christmas has the market covered in gingerbread? Not Dylan's Candy Bar. To mark the celebration of all things ghoulish this Hallowe'en, they're serving up a new holiday take on an old favourite. 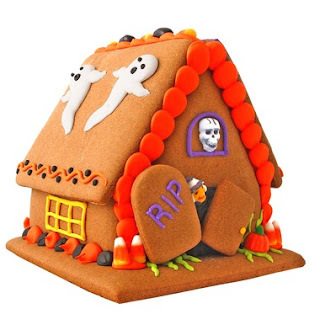 Take a break* from all the super sugary chocolate collected throughout your Hallowe'en travels, and feast upon this haunted house, gingerbread stylee! *taking a "break" from chocolate is not really recommended by me. I was just trying to be all PC about sharing the junk food love with the gingerbread.